My love affair with Irish Setters began in 1981 like most people who fell into this wonderful breed, by reading the book "Big Red" by Jim Kjelgaard and watching the Disney movie by the same name. In 1982 at the age of 11, after much begging to my parents, I bought my first Irish Setter named "Bo". He couldn't have been more perfect in my mind, though he was only a pet quality dog. I entered my first dog show that year when Bo was only 5 months old at an AKC specialty match held by the Irish Setter Club of Greater New Orleans. Bo took Best Puppy that day. I made many new friends that day in the Irish Setter world and owe my knowledge and enjoyment of this wonderful breed to each of them. And so the story began......Since Bo, I have owned seven beautiful Irish Setters. 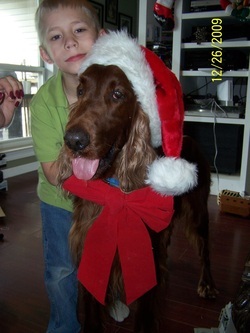 Currently, we have four Irish Setters along with four other dogs that we love, show and raise.